Shea 5-pc. Counter-Height Dining Set Straightforward but certainly not short on style, the Shea 5-piece counter-height dining set brings a beautiful and casual vibe to any dining area. This group's dove gray base and oak-finished tabletop and seats create a gorgeous two-toned look. The table's size makes it equally at home in a large or small dining room, or even an eat-in kitchen. Our favorite features are the table's four drawers and wine storage—convenience and class! Straightforward but certainly not short on style, the Shea 5-piece counter-height dining set brings a beautiful and casual vibe to any dining area. This group's dove gray base and oak-finished tabletop and seats create a gorgeous two-toned look. The table's size makes it equally at home in a large or small dining room, or even an eat-in kitchen. Our favorite features are the table's four drawers and wine storage—convenience and class! L: 15" x W: 15" x H: 25.5"
Problem with the table top. We love the set, but the table top veneer has bubbled, cracked and peeled. R & F is sending us a new table top, but they ave to solve this problem with the manufacturer. You can't clean a kitchen table by dusting it with a soft cloth. This is a great table!!! It was just the right size for a bump out in my kitchen and the storage was the added bonus I was looking for. Very sturdy and very well made. I have a small kitchen, so needed a dining set that was compact and attractive. I'm very pleased with this 5-piece set. The stools store under the table, saving me valuable space. The quality and appearance are outstanding. Inez Milligan is my consultant and she couldn't have been more helpful and pleasant. The delivery staff was also very accommodating. Shopping at Raymour & Flanigan is a pleasure. I Can't praise it enough! This is the one piece of furniture I own--that people constantly compliment; guys and girls alike. It's a good looking substantial piece of furniture. I keep the wine slots filled and the look is pretty fancy! Beautiful set, but unfortunately for decorative purposes only. Very bad quality table top. Veneer bubbled and cracked. R&T suggested that damage was done after a water spill. A water spill on a kitchen table, how unexpected! R&F will not replace it, unless you invest in additional protection plan. And the service department has very unfriendly customer service. Very, very disappointing. Waste of money. This set looks great unfortunately it is extremely poor quality. The top is bubbling and splitting. We use placemats and a runner is kept on it as well. I find it extremely unsettling that someone over the phone says “you did It” it’s water damage. Seriously? It’s in sunlight and apparently the glue that holds the wood to the table top has air pockets. It’s splitting. I am Awaiting repair, expecting replacement. I have 2 homes that need to be furnished. Bad move Raymour Flanigan. Have had it a week, awaiting our glass top, love the look, height, size of this piece of furniture. The stools fit under it perfectly when not in use to make for the maximum room. Great storage in the drawers, we also use the wine racks for storage other than wine. Highly suggest people with small to medium size kitchens to purchase this if looking for a nice bar and another table to sit at for breakfast or lunch. Table Top cracked & peeled after 1 month. We love this set! Unfortunately for a kitchen table, it can't get wet. Repair guy came out, and made it worse! Bought the protection plan. They said if I have it replaced, it will void the warranty. How is that fair when the table top cracked & peeled in less than 2 months of getting wet! This is the manufacturers neglect! Its a kitchen table, and kitchen tables get wet! Poor quality table top. The finish is starting to flake off after 3 months. We didn't get the protection plan but will be calling raymour tomorrow. Even if its replaced I'm sure we'll have the same problem again. STAY AWAY! This is a great set. I had a small area, and have been looking for a long time for something to fit. The stools fit under the table, plus space for wine bottles and 2 drawers......such a great find. It looks great. Very well made. I purchased this dining set; and received it two weeks ago. I love it, and family and neighbors cannot stop complementing it. I recommend this for anyone with limited space. To give this an even more modern look and feel, I threw some sheepskin throws on the chairs, and they look great! The draws and wine racks on the base are really cool as well. I purchased this dining set, and the Wallace reclining sofa with the assistance of my salesperson at the Fairfield store, and could not be happier for the Holidays. She was so helpful, without being pushy, or overwhelming. The product is beautiful. However, we purchased it four months ago and the table top is starting to peel/crack. Very unnoticeable however, not sure this should happen after a few months. We were told not to use cleaners and haven't. A bit disappointed. Great piece except if you get wet must dry immediately huge bubbles and has missing color of wood in one section otherwise great piece. Must use place mats for placing down everything. Had this delivered yesterday and even with multiple conversations with the online sales associate the color is NOT what we expected. It is not White in ANY way and it is NOT GREY - it is more like a taupe/beige. The furniture itself is nice for the money but the color is NOT represented on the website well or described well. Very disappointed and now we have to pay a restock fee. Don't be mislead. Great piece. Nice and study to stand up to daily meals with younger kids. Plus it looks great. Well worth the price. Nice sturdy compact piece. I did change the knobs tho to a nickel finish with a square shape. Looks great!!!! Looks like an island when not in use. The color is nice and it's solid. The wine rack and drawers are a nice plus. 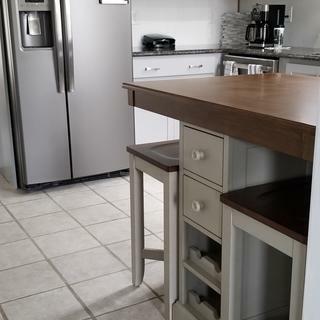 LOVE it, fits perfect into our kitchen which was too small to fit an island, but had a huge empty space otherwise. The kids love it too, they have their own drawers. I love the compact size & the fact that you can store items in the built in drawers. Also, the fact that the chairs go flush into the set. Love at first sight & one of the best furniture purchases I've made in a long time. I enjoy the traditional finishes, and space conscious size of the Shea dining set. The table is perfect for any room. Perfect for our kitchen.Well made.Love it. I just bought this kitchen set. For many years I’ve been looking for the right size and right color to go with my kitchen. I’m so excited!. This set is beautifully made, very strong. I normally don’t give reviews, but when I bought it. The previous ratings helped me decide, I decided to help someone like me make the right choice. Highly recommend it. A sturdy and functional kitchen table for everday use. I have not really used this set since I received it. But I love that it’s so compact in the limited space in my kitchen. It’s a beautiful piece. The color goes perfectly with my floor tiles as well. I can’t wait to utilize it and see how well it holds up in quality. It looks like a well built piece. I’m happy with it. Lots of people complimented this set! We placed it in our kitchen to serve as our mini island with chairs. This table and chair set is the perfect size for our smaller kitchen. Very good quality wood, sturdy, and looks great. We got a fair price. New table set. New look! Am very happy with the table set. Picture in brochure is basically how it looks. Redoing kitchen area to have everything coordinated. Will send an updated picture then. Absolutely love this piece! Needed a small table with seating for 4 and this absolutely worked!! Doug, salesperson, was great, too! This dining table is perfect for my breakfast area. The perfect size, my guess love it!! It fits so perfectly in my tiny space and is just right for my family! A great set for my small space. The storage of 4 drawers and wine racks is a plus! We were looking for something to fit in our small kitchen and we saw this and bought it. It is a perfect fit and matches great with current colors. Design is slick and very sturdy. Love it. Sold and perfect for a small kitchen. If you need more space this works great in a small kitchen. This is an awesome table set solid wood!! Very well made!! This was an impulse buy, after ordering bedroom furniture. Saw it, had to have it and got it in 2 days! We love it! Great set. Sturdy, goes great with my cabinets and fits perfectly in my kitchen. perfect for four for breakfast, lunch or dinner. Love it! Love it!! Different and unique. I suggest for small apartment.. loook great!! We love our new table . It fits perfectly in our kitchen nook and is like an island we don’t have room for! Wonderful set, fits perfectly in my small kitchen. It's a very unique counter height table with storage and 4 stools. Plenty of elbow room. Absolutely love it!! Delivery was a few days after placing the order. Love the 5-Pc counter-height dining set. 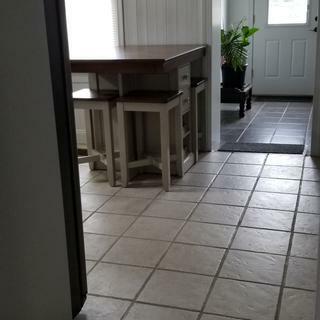 It's perfect for a small kitchen because it saves so much space being able to hide the chairs totally under the table. I love this set. 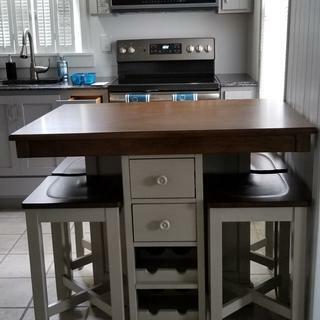 It is a nice addition to a nook space between the kitchen and small family tv room.The table surface is large, but the stools can be compactly stored under the table. What's not to love? Perfect! The drawers are a plus if you need extra storage. I purchased the grey. Love-love it! How big is shipping dimensions? BEST ANSWER: The set includes cartons of the following dimensions: 3' x .5' x 3.2' for the top, 3.2' x 1.5' x 2.75' for the base, and 3.7' x .5' x 3.7' for the bar stools. I think we're missing pieces for assembly. We got the stools assembled, but can't find any hardware for the table base or top? What brand paint was used to match color to walls? BEST ANSWER: The paint used in the image is Sherwin Williams Drift of Mist SW 9166. Please keep in mind, the color may look different in your home due to difference in lighting and monitor settings. Is the measurements to the table accurate to the description listed? I heard sometimes they can be a little off. BEST ANSWER: We're sorry this has occurred! For assistance, please contact our customer care department at 866.383.4484, option 7. We would be happy to help and get the hardware shipped out to you! BEST ANSWER: Hello Deborah, thank you for your interest in the Shea 5-pc. counter-height dining set! This is made up of Kiln-dried poplar and engineered wood frame materials with oak and pine veneers. is it sturdy enough to put a glas top on it? BEST ANSWER: The Shea Counter-Height Table is sturdy and can accommodate a glass top. BEST ANSWER: The wood top is dark oak and the remaining of the piece is finished in a dove gray. Do you sell any "bar height stools" that match the table set with counter height stools? BEST ANSWER: While we do offer similar styles, the Shea collection does not offer bar height stools. are there chairs with backs available that match this Shea kitchen table set? BEST ANSWER: The Shea collection does not include matching chairs with backs. BEST ANSWER: The Shea Counter Height Dining Set is made in Vietnam. Do you have any other colors?? BEST ANSWER: The Shea Counter Height Dining Set is available in the Dove Gray color only.